It’s cold and flu season as well as the holidays, which means that plenty of people are taking time off work — and this includes your doctors! It’s also true that colds, flus, and other illnesses or injuries don’t wait around for a “good time” to strike. If you find yourself traveling or can’t get in to see your usual medical care professional, turning to urgent care clinics is often an excellent solution. They’re equipped to handle colds, flu symptoms, and injuries that don’t require emergency care, like sprains or fractures. Many have extended hours and some may even be open on weekends or during some holidays. There are also over 7,000 urgent care clinics in the United States, so it’s likely that there’s one near you. We’ll discuss below why you should get familiar with your local urgent care center. What’s the Scoop on Urgent Care? Urgent care is a type of walk-in clinic that delivers medical care for cases that need immediate care, but aren’t quite emergency room level. They’ve surged in popularity in recent years, perhaps in part due to the prevalence of the centers, their affordable price point, and flexible hours. They provide care for almost 160 million patients every year, with just over 7,000 urgent care centers in the country. And the Urgent Care Association of America reports that from 2017 to 2017, the number of centers grew 5%! Urgent care centers are particularly heavily relied on in rural areas, where the nearest hospital or doctor’s office might be farther away. Regardless of where you live, it’s a great idea to get familiarized with the one nearest to you. You never know when you might need one in a pinch and knowing exactly where to go will save you time. What are the Advantages of Heading to an Urgent Care Clinic? 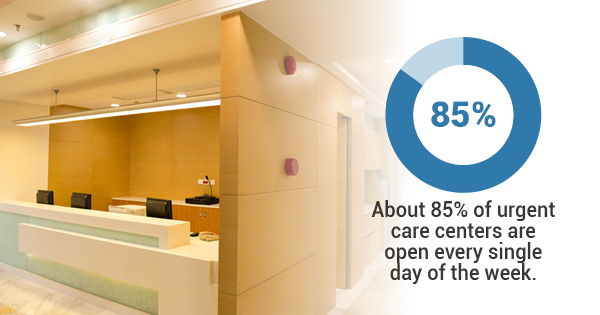 One of the greatest draws for urgent care centers is that they usually have extended hours. They might be open earlier or closed later than most businesses, giving people a chance to pop in before or after work, if needed. About 85% are open every single day of the week as well, so if you’re sick on the weekend, for example, you can still receive care or a diagnosis. Plus, most urgent care centers are walk-in clinics, so you don’t need to make an appointment ahead of time. Even though there are no appointments, wait times tend to be much shorter than in a doctor’s office or emergency room setting. Most people are in and out within sixty minutes. When your time is short, this can be so valuable. Compared to emergency room prices, a visit to urgent care is downright economical. Depending on your insurance, you may have to pay a small co-pay, but usually, no other payment is really required. And most urgent care clinics take a wide variety of insurances as well. All in all, you get good quality medical care with much less hassle — and at a reasonable price! What’s not to love? When Should I Seek Emergency Care Over Urgent Care? Urgent care is meant for medical cases that need immediate care, but not emergency care. If someone is showing signs of heart attack or stroke, they need to be sent to the emergency room immediately. Similarly, losing consciousness, heavy blood loss, or any injuries to the head, neck, or spine should be sent to the emergency room. The general rule of thumb is if it’s a life threatening situation, they should be getting care at the emergency room, not urgent care. If it’s an uncomfortable situation (think a broken bone, strep throat, or a UTI), but won’t be putting a life in danger, urgent care is often the way to go.